In 2010 Monoswezi released the album “Monoswezi” on the Parallell label. (www.parallell.eu) The cd has been critically acclaimed in Norway and abroad, and have been played on radio in Canada, USA, England (bbc), France, Poland, Serbia, Czech Republic, Germany, Sweden and Norway. The population in Mozambique and Zimbabwe, has a distinctive, long and rich musical tradition that is very strong in the society today. In addition to vocals, important instruments are, drums, percussion, local marimbas in all sizes, and mbira. The mbira is considered the national instrument of Zimbabwe, and has been played by the Shona peolpe for more than a thousand years. The traditional music in Zimbabwe and Mozambique has many similarities with Western music. The rhythmic foundation of the music can be found in parts of the American jazz tradition, while it has repetitative and thematic similarities with the music of contemporary composer such as Steve Reich and Philip Glass. Very often, this music will be accompanied by dancing and participation by the audience. There is little distinction between the performer and the audience, both are often actively involved in the music-making. 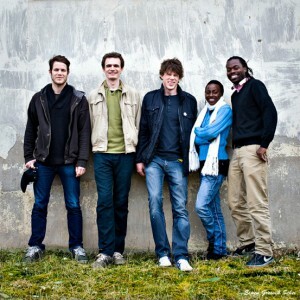 The musicians in Monoswezi are also involved in bands like Ola Kvernberg Trio, Lekverk, Sidiki Camara Band, and Tore Brunborg Trio. Hallvard, Putte and Erik has also had a longer stays in Mozambique, Ghana, Cameroon and Gambia and have been playing with a variety of musicians there. Global Oslo Music presents: Funky Kingston! Funky Kingston at Nomaden is a classic! a dancefloor full up of smiling faces and winding waists while funky and soulfull classic music from Jamaica and beyond bump Nomadens speaker boxes…. the last such session for 2011 so dont miss it! 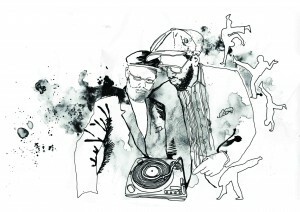 Mens vi venter på plateselskapene å oppdage denne sizzling duoen presenterer vi live nu-soul og funky r’n’b med KENYA & NEMOR + ​​bånd! En smooth og sanselige lyden av sin egen påvirket av slike som Marvin Gaye, Earth Wind & Fire, Atlantic Starr, Sade, Jill Scott og Maxwell bare for å nevne noen, og du har Kenya og Nemor. 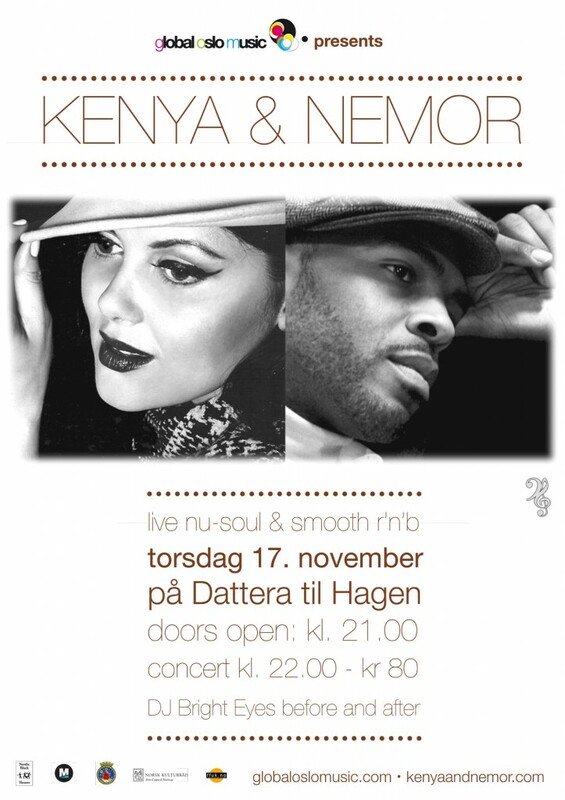 A smooth and sensuous sound of their own influenced by the likes of Marvin Gaye, Earth Wind & Fire, Atlantic Starr, Sade Jill Scott and Maxwell just to name a few and you have Kenya and Nemor. If the midnight sun had a voice, it would touch that inner chord that transforms simple tones into something so much greater. That is the vocal caliber of Icelandic-American Kenya Emil, lead singer of the duet Kenya and Nemor, who are gearing up to bring their music to audiences all over the world. Behind Kenya shines a radiant Southern moon that shrouds her softly sung melody with the perfect texture to make the sensation complete. It is Jay Nemor, a Texan songwriter deeply connected to the very roots of soul music. When they perform, the audience asks itself: “Why don’t they make music like that anymore?” Well, they do and it manifests itself in this duo. The album Just Becuz has been a long process for the duo. Two souls from two different worlds collaborating to fuse their different perspectives of the colors of music. The connection was instant and their perspectives just seemed to blend together to form a warm blanket of sound which is now available for the world to enjoy! Available here at our site,Itunes, Amazon, facebook and more to come. For those who would like to order physical copies click here. Also available soon on vinyl!